Not long ago, The New York Times published a front-page article* about the declining sales and possible death of the picture book. Increasingly, parents and teachers are bypassing picture books for chapter books in the hopes of accelerating their reading skills and boosting their standardized test scores. But there is nothing standard or predictable about the imagination or how it is developed and nurtured. 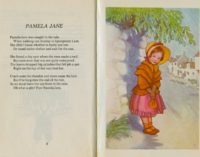 As an author of thirty children’s books, including many picture books, I cannot imagine what my life would have been like if not for the pictures in the books I loved and poured over long before I could read. I’m not an illustrator, but the images in the books I loved as a child made a deep and lasting impression. My parents used to read to me from a book of nursery rhymes filled with pictures of old-fashioned children in knickers and lace pantaloons skipping through meadows in a faraway land called Long Ago. Because of the old country rhymes, I came to associate the world of stories with a rural past irrevocably lost to me, for I sensed that the world of cottage gardens and country lanes was fading, at least in our corner of Connecticut. How I longed to climb into the book and skip away into that land of long ago! Standing at my bedroom window gazing down into our big shady back yard, I imagined I could glimpse this faraway land through a fold in time. I saw a boy in knickers and white stockings scrambling over our backyard fence, and a girl in lace pantaloons running through the shadows. Or was it just a trick of the mind, the sunlight flitting through the leaves? This sense of a past forever lost became part of my developing writer’s sensibility. Somehow, some way, I had to get back to that deliciously elusive land. And the only vehicle that could take me there was my own imagination. But what if it had not been for the pictures in the books I loved as a small child? Would I have devoted my life to discovering the stories I felt waited for me, half-visible, in the shadows of a vanished world? One of my favorite games was to make up stories to go with the pictures. But if there had been no pictures, would I have made up stories to go with the books? Would I, in fact, have become a writer at all? The imagination develops in strange and unexpected ways, in out of the way places, in odd thoughts, through the stories we love and the images that became a part of us when we were very young. Without the images, the inspiration of an illustrator’s rich imagination, the world would be a more arid and desolate land for our children.